Are you compromising your personal prosperity by not making regular superannuation contributions for yourself? It’s common for business owners to pay everyone else and reinvest profits back into their business before paying themselves a regular wage AND superannuation. It’s important to understand that short changing yourself can have significant consequences for your future prosperity as well as significant CGT implications should you decide to sell your business. Opting to leave monies in your business as profit rather than take superannuation leaves your personal wealth in the business. This means your future livelihood may be threatened should anything untoward happen to the business. Failing to extract personal wealth from your business can also result in missed opportunities for growing your personal prosperity through retirement savings and the compounding interest that accumulates on your super investments. You’ll also forfeit the considerable tax savings available in superannuation’s tax-effective environment. Ashley is a (fictional) business owner. Prior to starting his business at age 40, Ashley received an annual salary of $100,000 and his employer contributed the mandatory employer superannuation guarantee. While Ashley continued to pay himself the same salary, he didn’t pay himself super. Ashley pays himself an annual salary of $100,000 but does not contribute to super. Ashley pays himself an annual salary of $100,000 and contributes to super an amount equivalent to the employer super guarantee for an income of $100,000 pa. The following chart demonstrates that over 30 years or more, regular contributions to super that benefit from compounding interest can provide a very effective retirement savings strategy for Ashley. The projected difference in account balances for Ashley at age 60 for these two scenarios is $784,000. Disclaimer: The above projection is for comparison purposes only and is not a guarantee. The projection is not intended to be your sole source of information when making a financial decision. You should consider whether you should seek advice from a licensed financial adviser before making any decision about contributions to superannuation. For business owners under the age of 552 at the time of the sale of their business, superannuation can play a significant role in CGT savings. A CGT concession for small businesses provides a retirement exemption lifetime limit of $500,000 when the exempt amount is paid into a complying super fund or a retirement savings account. This in itself can have a significant influence on your future personal wealth. 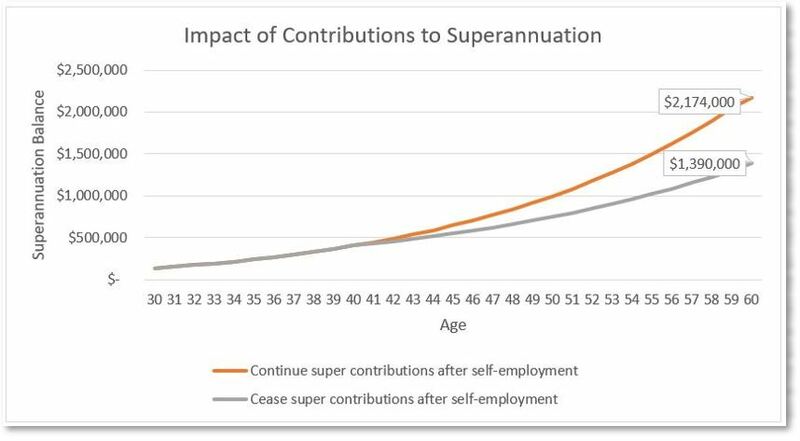 Your decisions around super are all the more important since 1 July 2017 when the concessional contributions cap was reduced to $25,000 per financial year. For many individuals and business owners, paying down mortgages and affording school fees have been the priority in the early years of their working lives. Most then relied on contributing large sums into super much later in their working lives when those expenses were paid for. However, the reduced annual contribution cap means that professionals and business owners now need to begin contributing to super earlier, at the same time as they are managing their living expenses. Otherwise, there won’t be sufficient money in their super by the time they retire. As a business owner, having an appropriate superannuation strategy in place is key to making the most of your earning capacity. Then when the time comes, you’ll be able to enjoy the retirement lifestyle of your choice. Importantly, if you are thinking about selling or making changes to your business in preparation for your retirement, I urge you to seek financial advice before you start the process so that you may take advantage of available super and ATO concessions. If you’d like to enjoy greater personal prosperity, your next step is to find out how you can extract wealth from your business and invest it in superannuation to make the most of tax saving benefits and wealth accumulation opportunities. As you’ve read here, the reduced super cap means you’ll need to manage your income so that you can plan for retirement, afford your day-to-day expenses and put any surplus cash to good use.